No getting lost on the Ark now, with a new guidebook out by River Runners for Wilderness. Duwain Whitis and Tom Martin have teamed up again to write a new guidebook titled Guide To The Arkansas River, Colorado. This is the only guidebook for the Arkansas River with USGS topographic map backgrounds, printed at their original scale, with additional map detail added in an easy-to-read format. The Guide covers the Arkansas River from Hayden Meadows the 115 miles to Cañon City. River sections include Pine Creek, Numbers, Fractions, Milk Run, Browns Canyon, Stone Bridge to Rincon, Rincon to Pinnacle Rock, Parkdale and Royal Gorge. The map pages show features such as rapids, scout points, river miles, campsites, highway access locations, and other points of interest. The accompanying mile-by-mile text describes the features on the opposite map page in greater detail, including rapid descriptions, campsite information, as well as geological, botanical and historical points of interest. Color photographs are included on almost every text page. The Guide is 8.5″ X 14″ spiral-bound to lay flat. The 62 pages are printed on tough water proof and tear resistant synthetic paper. 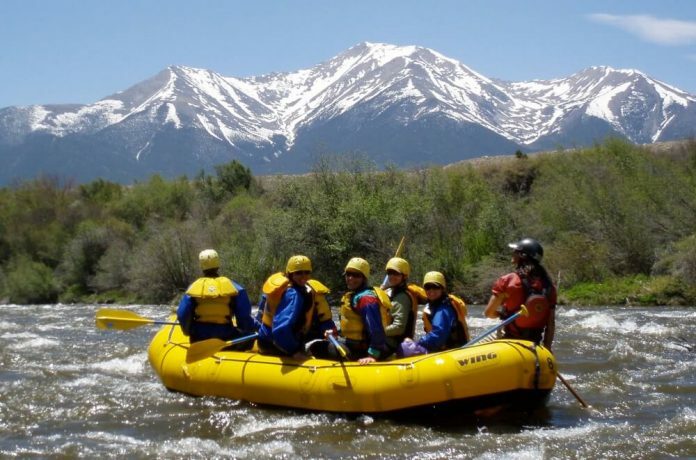 River Runners For Wilderness is pleased to be able to take advance orders for the Guide To The Arkansas River, Colorado. The cost of this river guide is $35.00 (29.95 plus $5.05 shipping and handling per Guide), with a tentative shipping date of March 20, 2019. Advance guidebook sales will benefit River Runners For Wilderness, a not-for-profit organization seeking equitable access and wilderness river protection for America’s whitewater rivers. There’s a new guide out to Colorado’s heralded Arkansas River. River Runners For Wilderness recently announced the release of the Guide To The Arkansas River, Colorado.